It’s the holidays! 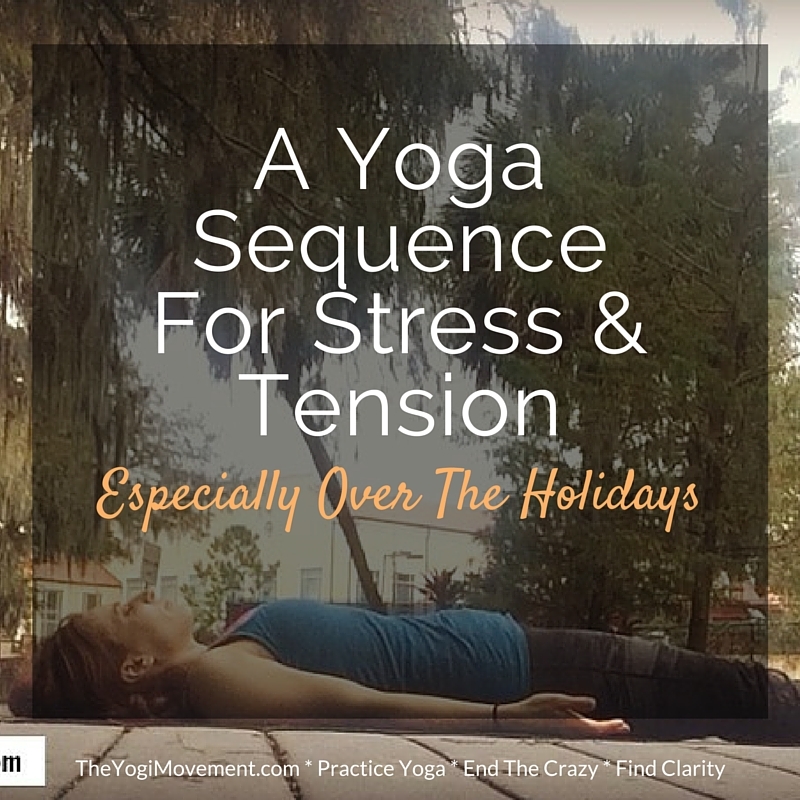 Even though it’s an exciting and giving time of year, it can also be mixed with stress. How many holiday parties do you need to go to? Who are you going to say no to? I mean, you can’t be everywhere! How many gifts do you have to give, and how much money do you need to spend on each person? Everyone says, “Oh no, don’t get me a gift.” But, you just know everyone’s going to get you something, and you’d just feel like a loser being the only person without a gift, right? By the way, you’re not a loser. You’re the most frickin’ amazing person ever, so stop. Anyway, this stuff can cause all kinds of anxiety and stress. So, I decided to come up with a yoga sequence for that. Do the simplest version of these postures. When you’re doing yoga for stress relief, you’re not trying to create intensity. Focus on being calm in this practice no matter how type A you are! 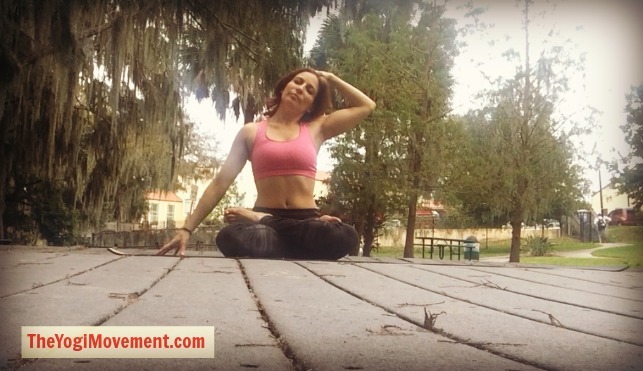 I chose all of these postures because they are for any level, and open the body in a way where you can be present and aware to what you’re feeling inside, and then surrender any tension through your breath. It will just take you about 15 minutes, but you can make it a longer practice with extra breaths, or the repeating of postures. The first posture we’re going to do is a flow of Cow posture (on left), and Cat posture (on right). We’re starting here because this will help steady the breath, warm up the spine, open the lungs, and strengthen the core. Start in a tabletop position with your keeps hip width apart, and the hands shoulder width apart. Press the top of the feet into your mat, and spread your fingers. Push through the shoulders and ground the hands. Inhale as you move into Cow. Drop your belly, and arch your back. Lift your head. 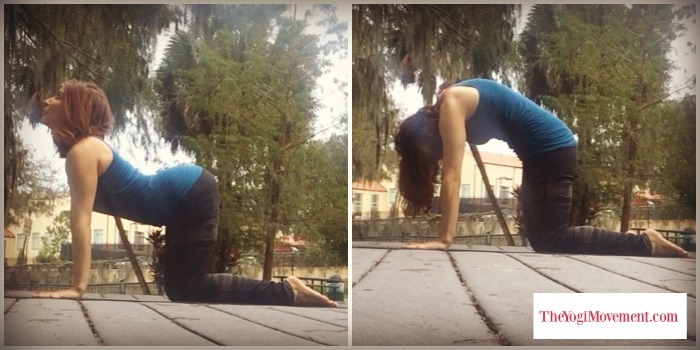 Exhale and arch your back moving into Cat. Repeat this 5-10 breaths to wake up your body and mind, and engage with your breath. Use this to set the tone for your practice as a meditation. Step your feet double shoulder width apart. 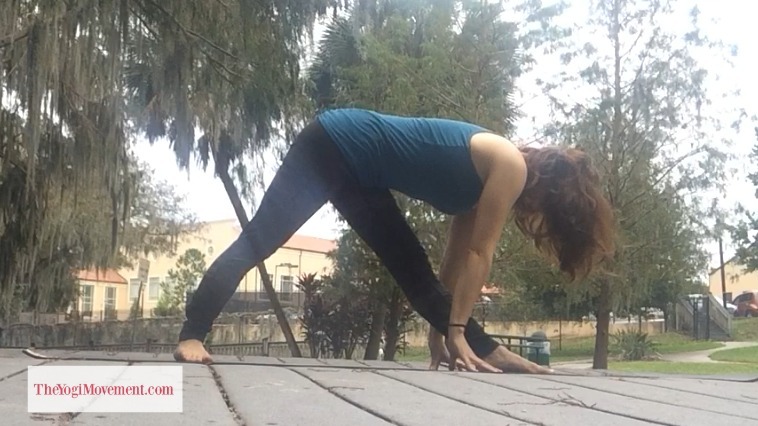 Turn towards your right leg, and fold over it. Bring your hands to the ground. Keep a straight spine here. Perhaps you can start to bring your chin to your shin, but don’t round your back. Keep your legs and spine straight. If your legs start to bend on the fold, just bring your hands up on your legs, and with every exhale, try to go a little deeper if possible. Take 5 breaths or more here, and then turn towards the left leg and repeat. Come to seated position, and bend your right knee bringing your left heel towards your right hip. Then bend your right leg over your left. Your right knee should be raised towards the sky and the foot totally grounded. Then, take your left hand on your right knee. Hug the around around, and twist looking over right shoulder. Keep the belly pulled in and the spine straight. The right arm runs behind your spine, and the hand grounded behind your back. Breathe deep for 5 or more breaths, and feel the deep stress relieving and detoxing twist. Only twist deeper on the exhale. Repeat on the opposite side. My feet are in lotus below, but you really just need to do a crossed legged position. Take the right arm over your head so that the elbow is above and in line (as much as possible) with the crown of the head. Reach the fingers down your back, and between the shoulder blades. Take the left arm, bend at the elbow, and start to move the hand up the back. Try to reach for the fingers of the right hand, and clasp hands. If you can’t clasp – no problem – just use a towel. Or, grab onto the fabric of your top. Open the heart here by pushing your head back into your arms, and move your elbows inward trying to align them one over the other. Take five or more breaths here, and as you inhale picture light moving into your heart center. As you exhale, picture any darkness and anxiety releasing. This posture is sure to let go of an emotional release. I always hold this posture longer that usual if I’m feeling stressed or lost in life. This is where we keep emotions hidden down like anger, anxiety, sadness and frustration. 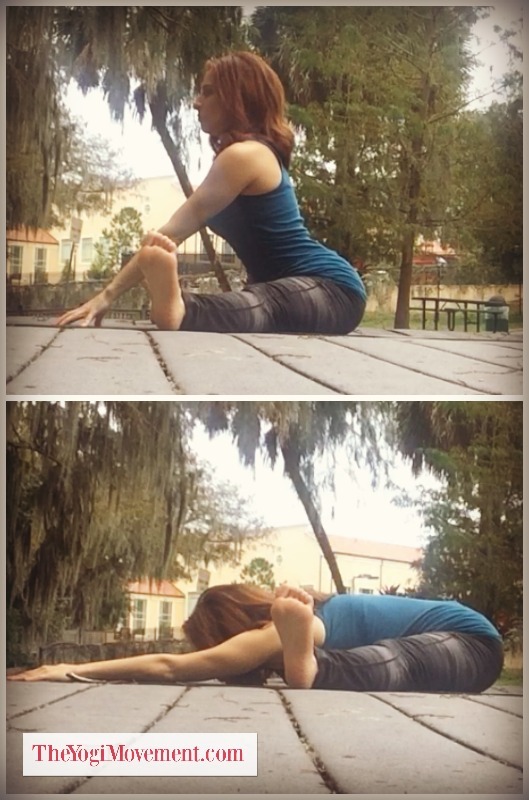 Open your feet like a book and press the sides of the feet together. This will start to open your hips. 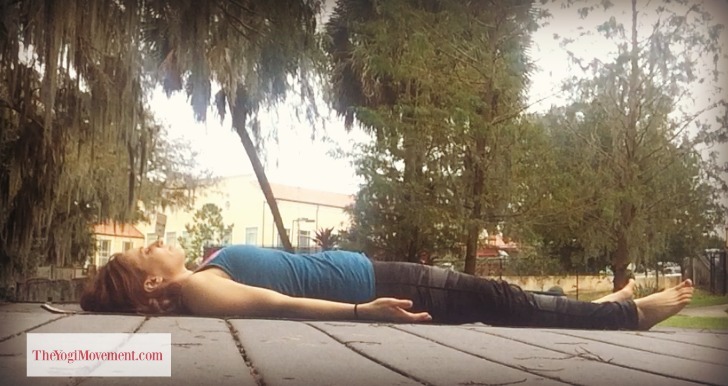 Really become aware of how you feel in your hips. Is it tight, sore, achey, or does it feel delicious? This posture always feels delicious to me, but it wasn’t always like that. Breathe deep. The hard part is surrendering in this posture. You might have a tendency to push hard, but see how you can release your knees towards the ground with total surrender. Just go to where you hit your sweet spot, take 5 or more breaths, and release. Bring your legs out wide, and start to walk your hands forward. Flex your feet, and roll you knees towards the sky. Just stay here for a few breaths. Then, walk your hands forward a little more. Maybe fall onto your forearms. Check in with your knees and make sure they’re not rolling forward. Stay strong in the legs. If you’re feeling flexible then walk your hands all the way out and rest your belly, chest, and chin on the ground. Release, let go, breathe deep. Take 5 or more. Keep your legs and feet how they are from the previous posture, and then sit up with a straight spine. Reach your right arm over your head to your left foot. Let your left arm go the opposite direction on the earth in front of you. Your left shoulder will try to graze the ground, and your hand will reach towards your right foot. If you can’t reach the foot, or your shoulder doesn’t’ reach down to the ground, no problem. Just work on the side stretch by bringing your right hand over your head. Straighten the arm and reach it over diagonally. Let your left arm release to where it feels comfortable. Take 5 or more breaths and repeat on the other side. There’s always a way to make any posture work for you! I say hold this posture for 10 deep breaths. You can see in the picture I have my knees off of the ground, and I am balancing just on my hands and feet. Try it, but no harm in dropping the knees and legs to the ground. Pull your shoulders back, slightly lower the head back as you extend the front of the neck, but gaze towards the nose. 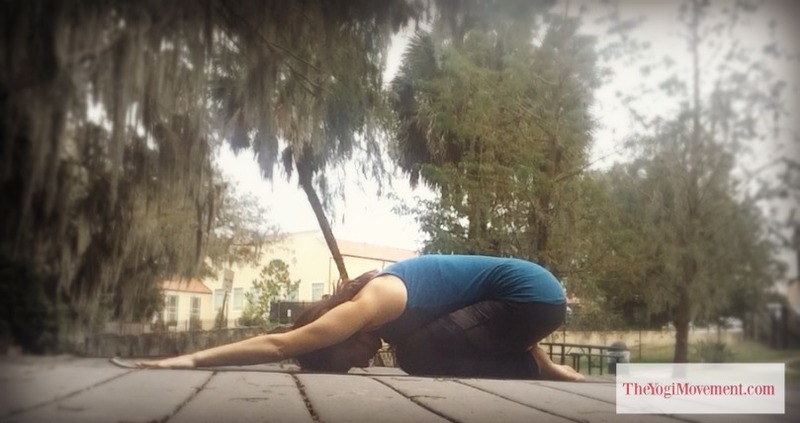 Open your heart and arch your back. In this posture stay strong in the legs. Press your big toes into the ground so that you don’t roll your heels out. Root your hands and spread your fingers. Imagine your fingers growing roots into the earth as you bring the strength and energy down through the arms from the shoulders. Take 10 deep breaths here, and picture each chakra starting at your root opening with each breath. 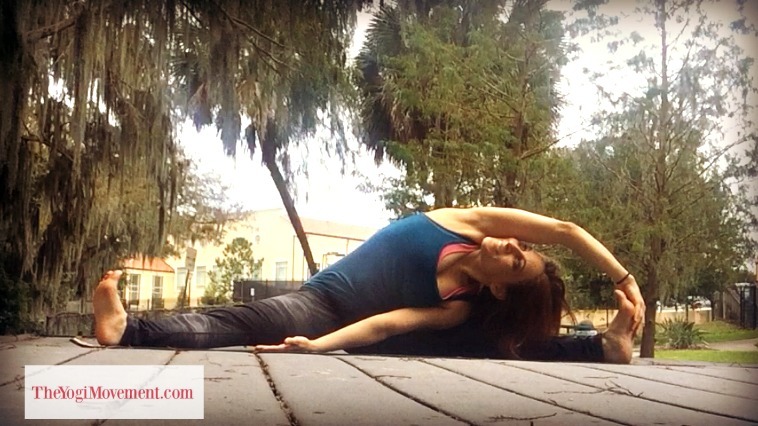 Feel the opening of the heart and throat chakra to get a deep feeling of the workings of the backbend here. Come to a seated cross-legged position. Take your right hand on the left side of your head right by your ear. Slowly pull your right ear to your right shoulder. Pull your left shoulder down. You should feel a neck release stretch on the left side. This is great if you’re always sitting in front of the computer, but also to release stress and anxiety that’s built up in your neck. I say enjoy this stretch for as long as you want. Count your breaths and repeat the same on the other side. Finally, we made it to the end. As you take child’s pose here, you can keep your knees together like me, or spread the knees and sit between the heels. Some people like to bring their arms back, but for this practice I want you to reach your arms forward. Inch your fingers forward and stretch your shoulders. So many postures use the strength of the shoulders, so make sure you release them. Take as many breaths as you need. Lay all the way down. Start to breathe normally. You can even open the mouth and let out a big sigh. Scan the body and absorb all of the prana (life force) you just created. 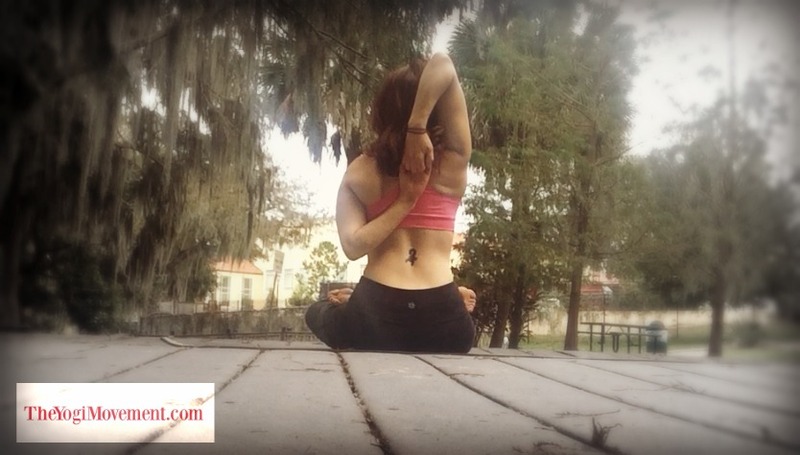 Release any tension in the forehead, jaw, shoulders, neck, hips, and chest. Let the palms naturally curl. Let your thoughts float away like clouds in the sky. Stay here for 5 to 15 minutes. As you come out of it, notice if you feel less stressed than you did before. Did your worries or anxiety subside a little? Were you scattered and overwhelmed, but now feel a little more at ease? Did something that you felt was a huge deal turn out to be a something minor after you took some time to calm your mind? Your action item is to do this practice for a week, and let me know how you feel differently. Believe me, I need it just as much as you! I’d love to hear your experience in the comments! If you loved this, I created a PDF download for you here. Now, you can bring the postures with you anywhere & leave your computer at home! « How Do You Track Your Hydration Goals? Here’s The One Thing You’re Missing….